These six postcards show scenes from the Battle of Little Big Horn one year after the June 25, 1875, incident between the U.S. Army's 7th Cavalry Regiment and a coalition of Plains Indians. 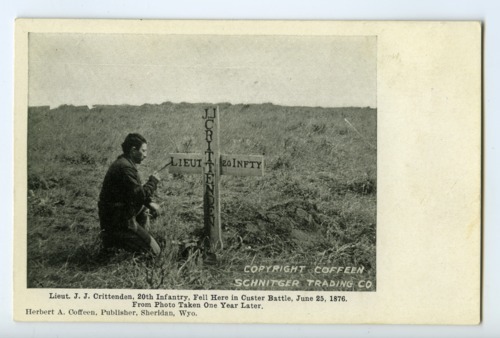 The images show monuments to Lt. J. J. Crittenden, 20th Infantry; a monument on the battle field, a pile of horse remains; a marker for Col. Keogh and 28 soldiers from Co. I, 7th Cavalry; a marker for Lt. Sturgis, 7th Cavalry; and the custodian's house at the Custer Battlefield National Cemetery.